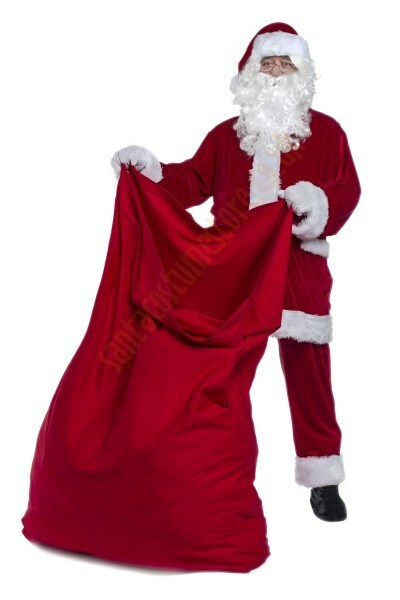 This complete velour Santa suit is a great choice for those Santas who spend a lot of time in heated interiors. 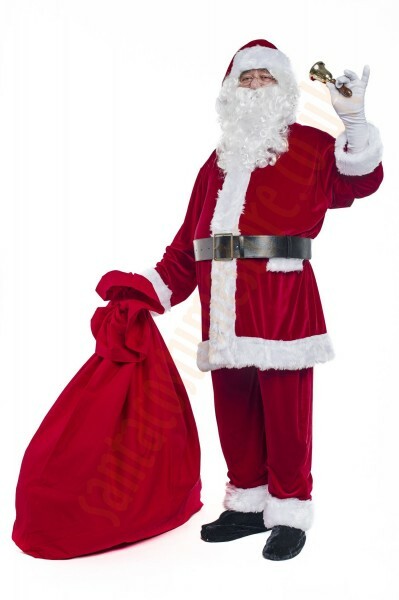 The costume is made of light velour thanks to which Santa can keep cool, and is finished with a snow-white band of faux fur for that elegant Christmas appearance. The set comprises 17 parts. 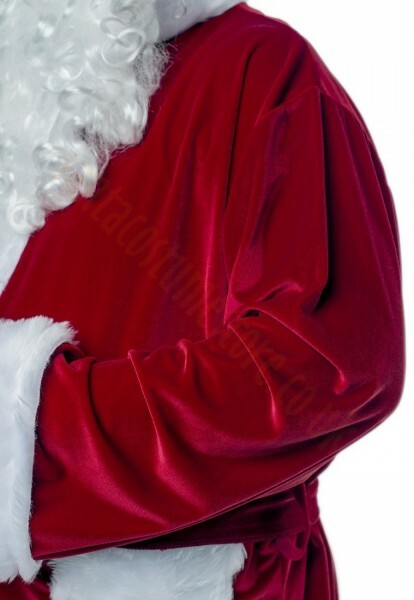 What is included in the complete set with the velour Santa suit? 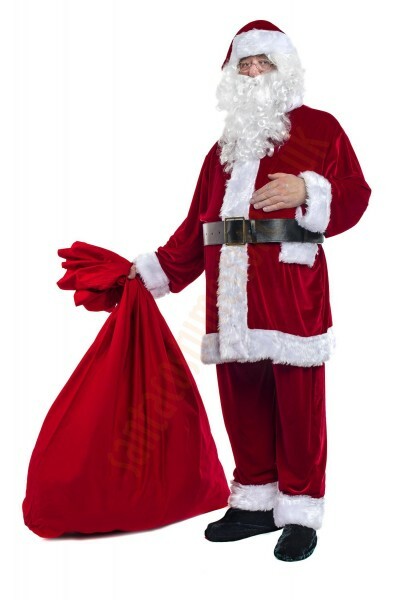 The complete Santa Claus costume together with all the accessories comprises: velour jacket, trousers and hat; a Santa’s beard (12"-15.5"/30-40 cm) with a wig and special glue for keeping it in place; an artificial leather belt featuring a metal buckle; velvet boot covers; long white gloves; a Santa belly; neutral-lens glasses with a case; a large sack for presents, measuring 43.5" x 55"/110 x 140 cm; a brass bell; a T-shirt; and a garment bag with a hanger for the costume. 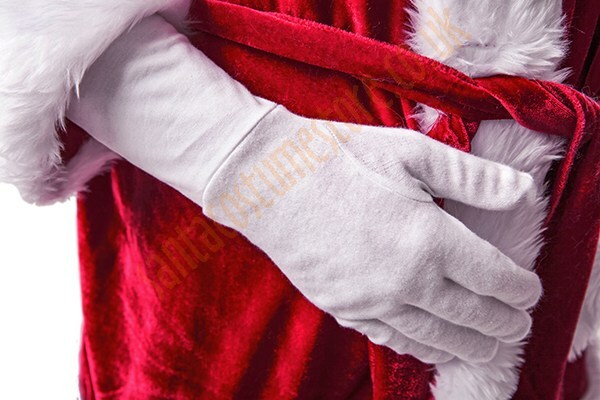 The Santa jacket is fastened with a zip, two very strong patches of Velcro, and a belt – all to make sure that Santa’s jacket won’t come undone at the least expected moment. Are you worried about the standard velour belt giving you a nasty surprise and coming undone when you least expect it? Are you looking for a more dependable option? 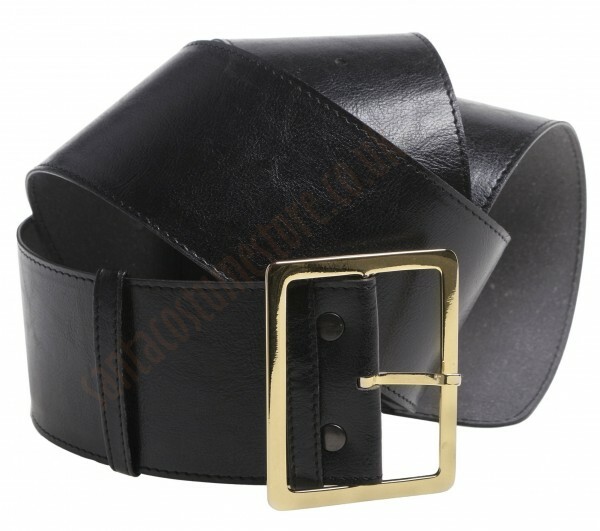 Our black artificial leather belt – featuring a striking light-gold coloured metal buckle (3.5" / 9 cm across) – will certainly meet such expectations. 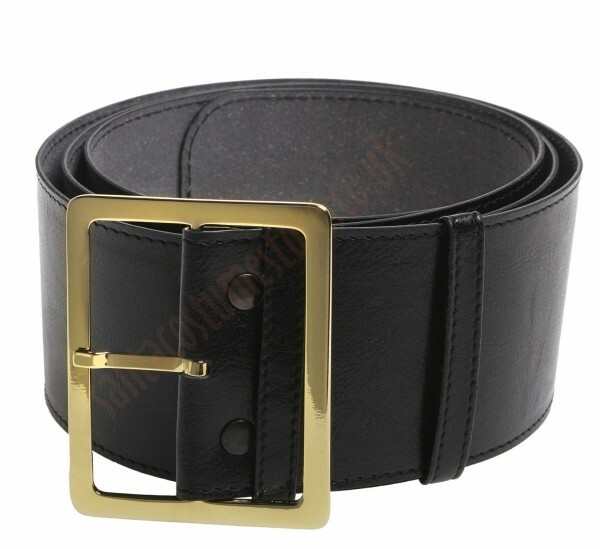 Santa’s leather belt is smart and considerably wider (3"/7 cm!) than your typical trouser belt, on top of which it is 65" (165 cm) long, has two belt loops and 26 holes – ensuring gradual adjustment and a perfect fit for the size of Santa’s belly (whether fake or real). To make the belt even stronger, it contains an extra textile insert. 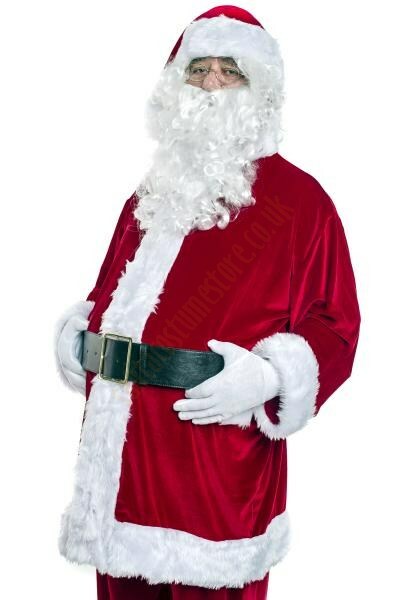 The belt matches the Santa Claus suit beautifully! 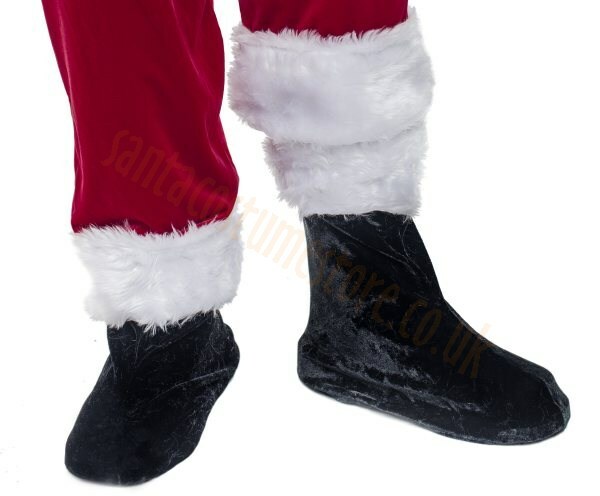 If you want to add that extra touch of credibility to your character, a good idea would be to put on our velvet Santa boot covers, trimmed with white faux fur (and perfectly matching the rest of the Santa outfit). The boot covers are held in place thanks to their elastic straps – one at calf height and two for fitting under the soles of the wearer’s shoes. With such boot covers you can be sure that your identify will remain a secret. 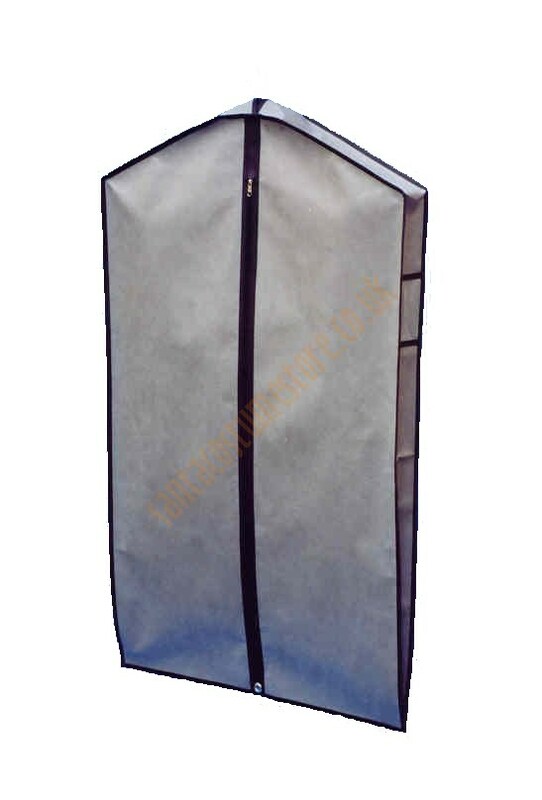 The covers suit all types of footwear, although the size numbers given under Sizes and options are for thick winter boots; should they be worn on top of light sports shoes or indoor shoes they will also suit shoe sizes two numbers higher. 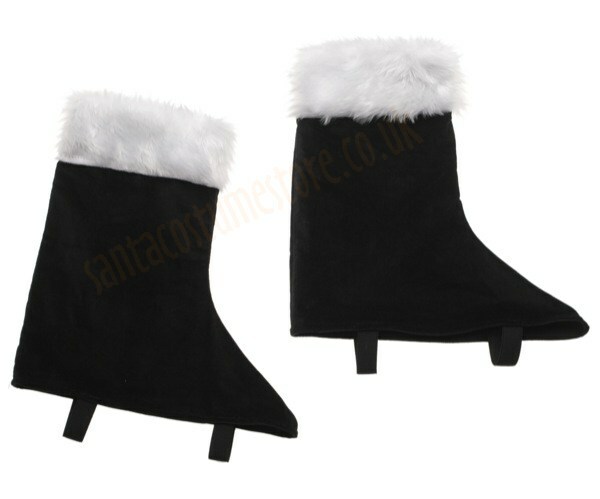 Artificial leather tall boots, or luxury Santa boots made of real leather, are also available as options. Should you not have a suitable beard of your own, then there’s no doubt about it – you simply must have one! 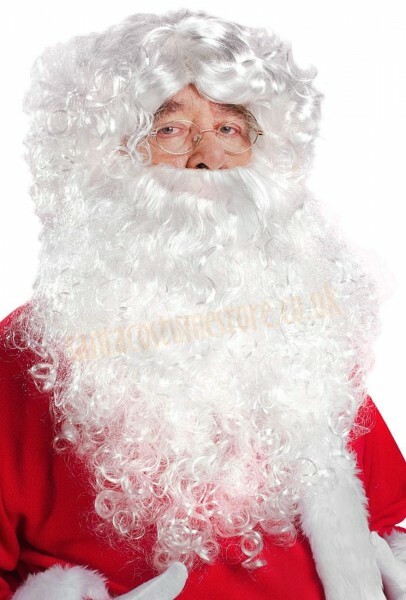 We offer a natural-looking white Santa beard together with matching wig. The beard is thick and curly, and 12"-15.5"/30-40 cm long. If you want, you can choose an even longer beard under Sizes and options. 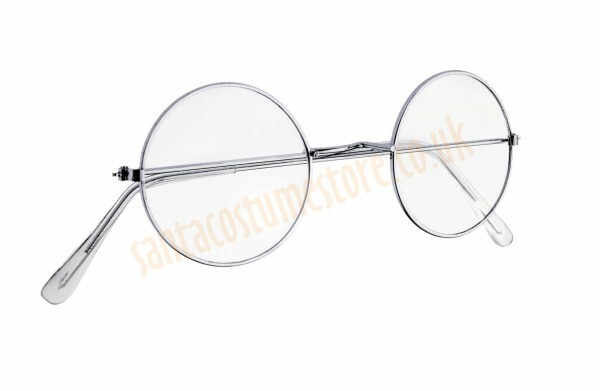 Apart from the two elastic straps holding the beard in place, you can also use the special glue (that comes in the set). 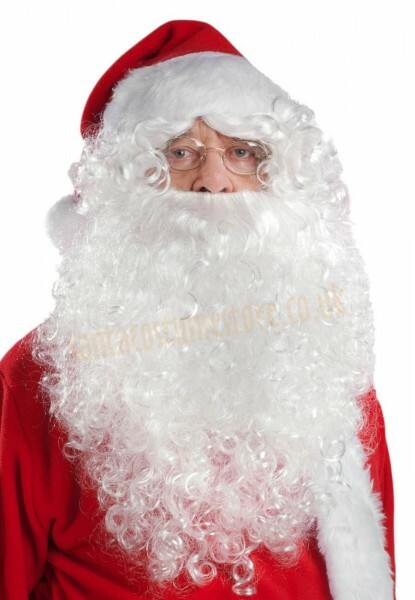 The wig completes the Father Christmas image, concealing the wearer’s own hair and ears, as well as the elastic straps holding the beard in place. 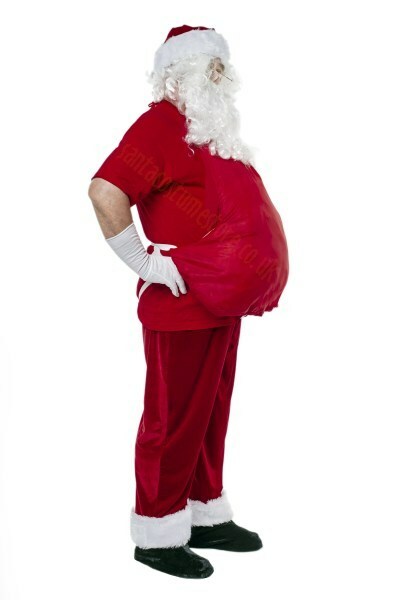 Father Christmas puts a great deal of effort into looking truly special on that one day of every year. 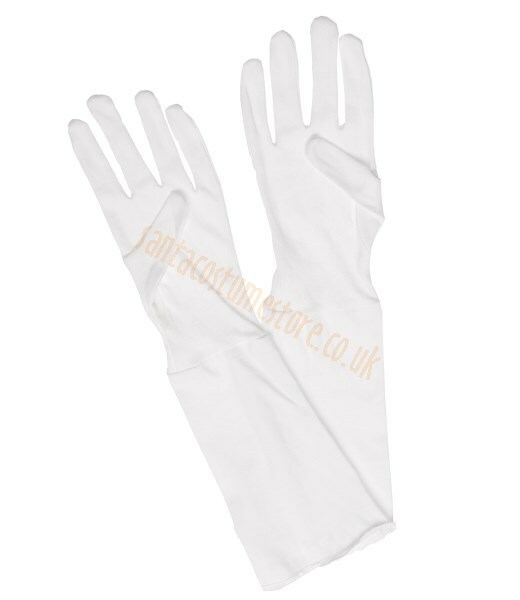 These long cotton gloves stretch 7.5" (20 cm) above the wearer’s hands, so nobody will see any bare skin or familiar wristwatch while Santa hands out his presents. 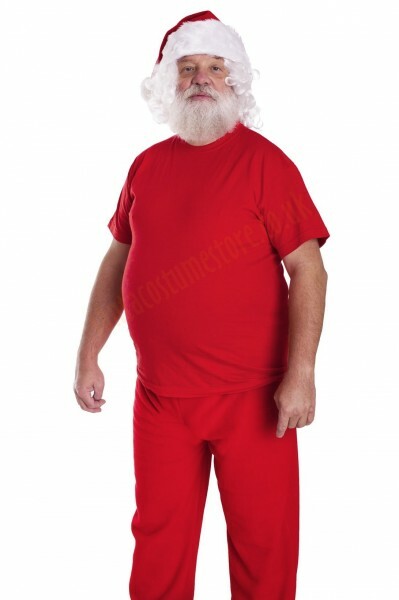 They constitute an excellent addition to the Santa suit, making sure he remains unrecognisable. 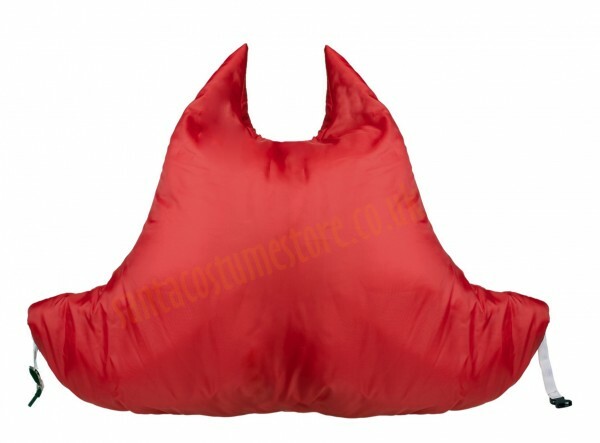 The red T-shirt worn beneath the Santa jacket means there’s no chance of you revealing yourself unwittingly to friends – and it will also keep your costume from getting sweaty. 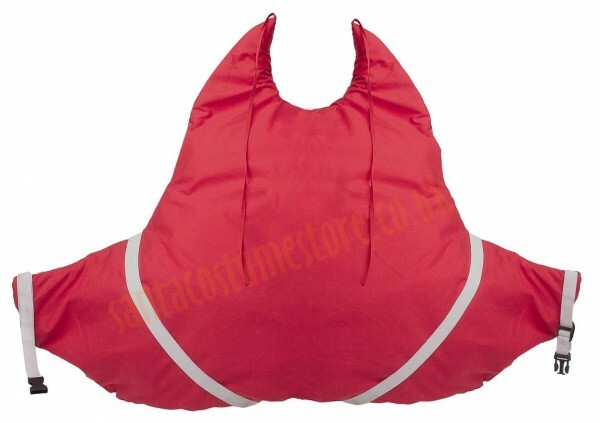 It is made of high quality (150 g/m2) cotton, and is reinforced with double stitched seams. The T-shirt comes in a universal size (XL). Ring, ring! Can you hear that sound? It must be Santa Claus. You always hear the loud ringing of a bell before he arrives. 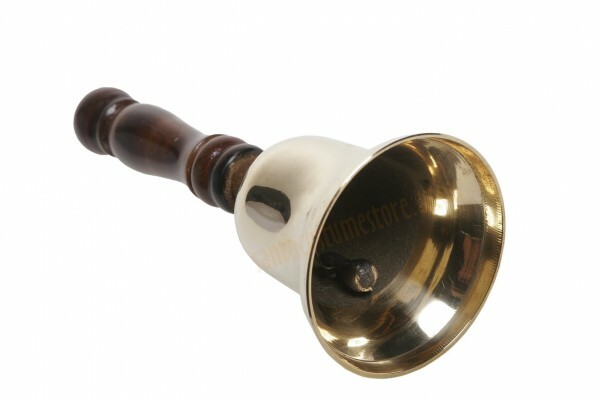 Santa’s brass bell, with a wooden handle, is 6.5" (16 cm) tall and the bell itself is 3" (7 cm) in diameter (there are other bells to choose from in the Sizes and options). 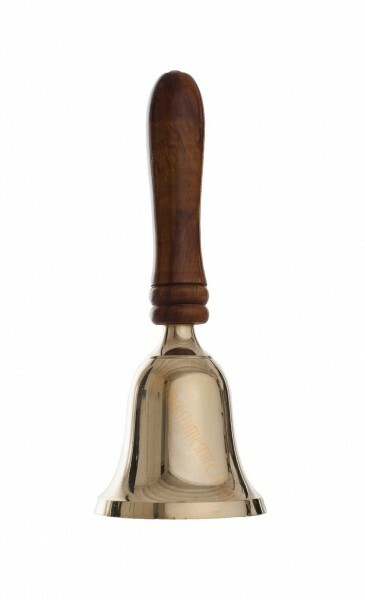 You can listen to the bell’s sound by clicking here. 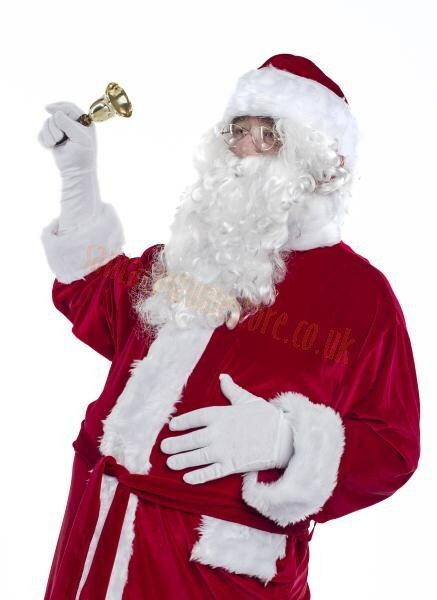 The bell will certainly help hold children’s attention – and perhaps if they’re well-behaved Santa will let them play with it for a moment or two? 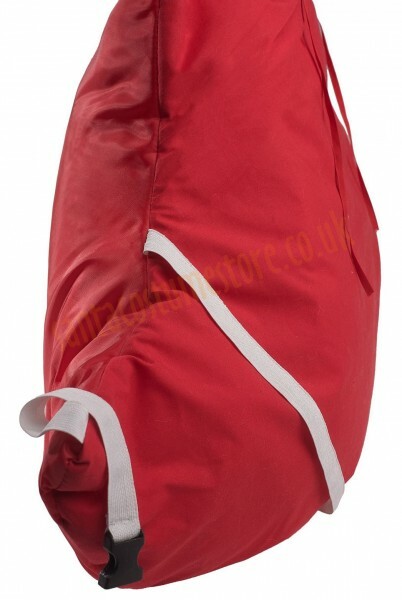 Our garment bag is a handy place for keeping the Santa costume (without giving rise to any suspicion) and taking it where needed. It holds the entire set, including the accessories. Grey and opaque, it measures 49"x24" (125x60 cm). 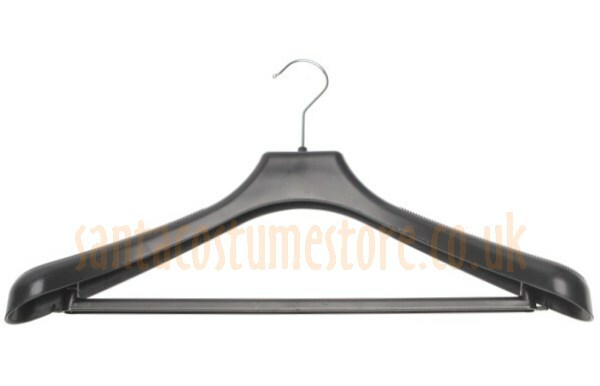 A broad plastic hanger is included (while a wooden hanger is also available as an option). 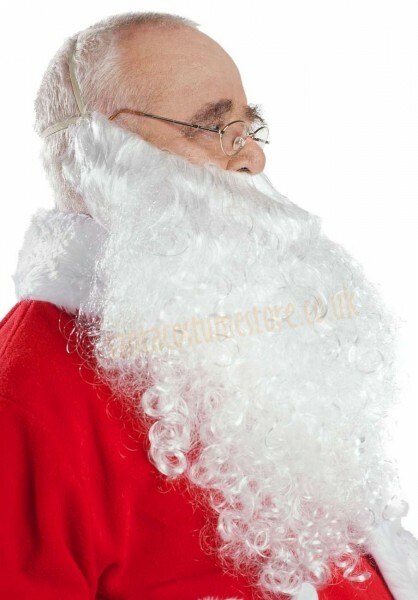 Do you want to be certain that your Santa beard will stay in place for as long as you are playing your part? Stick it on with our special MASTIX glue for the beard, a perfect complement to the elastic straps. The glue is gentle to the skin, and can be washed off with water or glue remover. 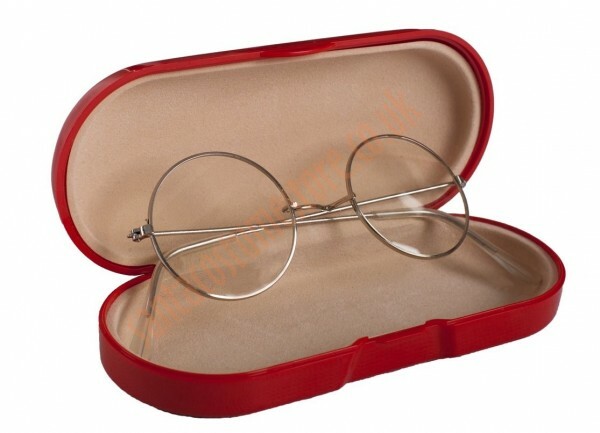 The set comes with a 2 ml container – with enough glue for 2-3 uses (larger ones are available under Sizes and options). The producer gives a 3-year guarantee on the product (although in practice it remains good for much longer).